Motivated Seller 10K Price Reduction! 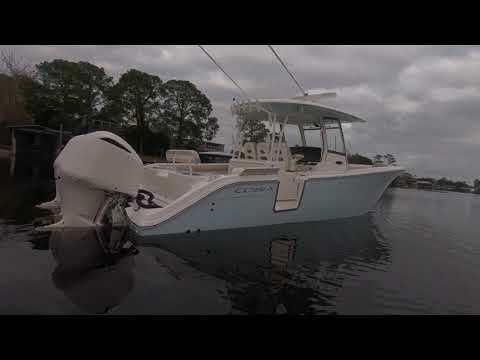 2017 Cobia 344 CC with Triple 300 Yamaha F300's for sale in Orange Beach Al. This lift kept, 344 is loaded with options and has less than 70 hrs! Owner custom ordered the boat with almost every option available! The Cobia 344 CC blends high performance, luxury and fishing smarts into a stunning package that will impress everyone from the sunset cruiser to the serious tournament angler. The double-stepped hull is fast, yet responsive and easy to drive, and provides a stable platform. The 344 CC leaves no one at the dock with a rare combination of elegance, comfort and thoughtful fishing features. Please call Yacht Broker CHRIS WHITE for more information (850) 723-7889.